Please welcome David Demchuk to The Qwillery as part of the of the 2017 Debut Author Challenge Interviews. 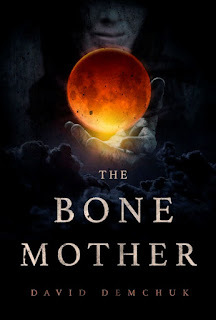 The Bone Mother was published on July 18th by ChiZine Publications. David Demchuk: I always had a vivid imagination and loved words and storytelling from when I could first speak (I was an exhausting child), so you could say I was a writer well before I could actually write. DD: While I often have a loose structure in mind (and quite often have something of an ending to aim for), I tend to be a pantser for the first third of any given project, and then more of a hybrid after that. DD: Overcoming crippling self-doubt and maintaining discipline and momentum. There's really no other way to say it. As I reach various milestones in a project (fairly predictable milestones at that), my confidence begins to waver and various insecurities creep in and then the second-guessing begins. By then I'm in the thick of it with no clear path through and I find myself wondering if I should go back keep going or tear back or give up entirely. It's at times like that that you have to turn a cold clear eye on the work and then, more often than not, just push through till you can get a better perspective. But it's tough. Every story I start, I feel like I've completely forgotten how to write and have to learn all over again. But after many years I've come to recognize it for what it is, and remember that there is no formula or recipe, there are no rules, you just have to write. TQ: You have been writing for theater, film, television, radio and other media for over 3 decades. How does this affect your novel writing? DD: Well, I have the benefit of years of experience--which hopefully translates into a certain level of craft, an understanding of structure and conflict, a respect for the values and characteristics of each medium I've written for, an awareness of the needs of the audience whether it's one person or one thousand. I have a certain level of discipline and tenacity, or flat-out stubbornness. And I'm old now, so publishers and producers and directors and editors are more inclined to trust me and let me have my way. Conversely, I'm more inclined to trust them and to let them into my process so we can support each other with our strengths. DD: In general, I'm still heavily influenced by books I read as a child and stories that were read to me, as well as the movies and television and music that I grew up on. My mother read to my brother and me from very early on, and I was a precocious and voracious reader throughout my childhood and teenage years. For specific projects, I am usually inspired by something I read in the news or overhear in conversation or a question or issue that comes up in my life that I can only work through by writing about it, creating a mental and emotional process where I can look at the question from different perspectives and the conflicts created between them. The Bone Mother is a bit of an exception in that I started it almost arbitrarily. I decided I would start the year (in this case 2015) with a new project and that I would find some photographs in the public domain to use as prompts--each one would be a different character, and in adding them all together I would tell a larger story and create a larger world for them. I was very lucky to find the archive of Romanian wartime photographer Costica Acsinte. His work was very much the impetus for the stories that make up the novel. TQ: Describe The Bone Mother in 140 characters or less. TQ: Tell us something about The Bone Mother that is not found in the book description. DD: Interspersed through the book are four longer contemporary pieces, set in North America, told by the children and grandchildren of those few creatures who survived. Some of them know their heritage, some do not. They are, in a way, part of a supernatural diaspora. TQ: What inspired you to write The Bone Mother? What appeals to you about writing horror and why did you focus on Eastern European mythical creatures? DD: As I mentioned earlier, the Acsinte photographs were the spark for the book. What they did, I think, was unlock a long-forgotten knowledge of and interest in the stories I heard and read about when I was a child, about the enigmatic forest witch Baba Yaga (who of course is The Bone Mother of the title) and creatures like the strigoi and the rusalka. Some of the classic monsters of horror--the vampire and the werewolf in particular--have their roots in these legends. I've long been a huge horror fan (in short fiction and novels, in film, television and video games), but had not had many opportunities to actually write in the genre. As I started the book, I realized that I was writing a series of love letters to the stories and characters that scared and delighted me as a young reader. TQ: What sort of research did you do for The Bone Mother? DD: I drew a lot from my own knowledge of Ukrainian culture and from life in small towns and on farms--I'm a prairie boy after all--but I did need to research some of the more obscure Eastern European legends, as well as what happened in Ukraine and Romania before and during the war. Many of the true stories are more frightening than anything that I could make up. TQ: Please tell us about the cover for The Bone Mother. DD: The cover artist is the award-winning Erik Mohr, who is responsible for almost all of the covers for ChiZine Publications. His amazing covers are one of the reasons why I first approached ChiZine. They're just such beautiful books. And while it's not an image specific to any one story, I would say that his illustration is a superb evocation of The Bone Mother herself. TQ: In The Bone Mother who was the easiest character to write and why? The hardest and why? DD: One section is about a young boy, Andreas, who visits a haunted house on a dare and finds a reflection of himself. This piece tumbled out in one evening of writing, it was like transcribing a horrible dream. His voice came out perfectly. I think it was one of two pieces that never changed from the very first draft. The hardest was a character named Gregor, the narrator of one of the contemporary pieces. As I reached his section, I had a crisis of faith around the intensity of the horror in the book. (In the end I needn't have worried.) As a result, I decided to write a character who would frighten me personally. Unfortunately I succeeded, and I ended up gritting my teeth, having violent nightmares, and just generally dreading every moment I sat at the keyboard. He left a nasty mark on me that took a while to get over. I promptly wrote a love story as a kind of antidote, and that piece can be found near the end of the book. TQ: Why have you chosen to include or not chosen to include social issues in The Bone Mother? DD: In dark times, people turn to dark stories for affirmation, for catharsis and for illumination. I think the best works of horror are those that speak both to the cultural anxieties of their time and to the ageless fears that we all carry. Much of The Bone Mother is centred on the effects of war on those who have the least power to fight, particularly on women and children. The fairytales and folklore that are the basis of The Bone Mother often focus on mothers and children--mothers who reject their children or who try to destroy them, mothers who try to save their children or who sacrifice themselves so their children may live, surrogate mothers who take in children that others have cast out or left behind. The book looks at that within the context of war in order to grapple with the choices that desperate people make in desperate situations. I also gave special attention to gay and lesbian characters and to characters who we would now consider to be transgender, as these voices and stories, particularly in historical settings, continue to be underheard and underappreciated. TQ: Which question about The Bone Mother do you wish someone would ask? Ask it and answer it! DD: "What scares you personally?" Everything scares me, actually--I'm a catalogue of phobias: heights, water, enclosed spaces, crowds, spiders, interviews ;) The one thing that doesn't scare me is snakes--I have always loved them (but I could never have one as a pet because I can't handle their eating habits). TQ: Give us one or two of your favorite non-spoilery quotes from The Bone Mother. DD: "Knitting is a good way to pass the time when you're waiting for something to die." "But the Bone Mother is a wicked witch who eats naughty children!" I cried. "Good children do taste better," she said wistfully, "but there are so few of them. If you can be satisfied with naughty children, you will always have food on the table. They are never in short supply"
DD: I will be at Readercon and Necon in the month of July, and I have some other readings and book launches scheduled between now and November. I'm expecting to start a new book in the fall--but that's as much as I'll say for now. DD: Thank you very much for inviting me! Three neighboring villages on the Ukrainian/Romanian border are the final refuge for the last of the mythical creatures of Eastern Europe. Now, on the eve of the war that may eradicate their kind—and with the ruthless Night Police descending upon their sanctuary—they tell their stories and confront their destinies. Eerie and unsettling like the best fairy tales, these incisor-sharp portraits of ghosts, witches, sirens, and seers—and the mortals who live at their side and in their thrall—will chill your marrow and tear at your heart. David Demchuk was born and raised in Winnipeg and now lives in Toronto. He has been writing for theatre, film, television, radio, and other media for more than thirty years. 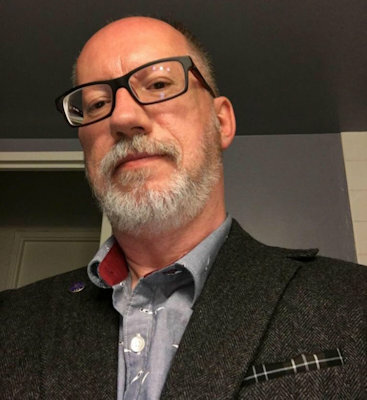 His publications include the short-fiction cycle Seven Dreams, and the Lewis Carroll adaptation Alice in Cyberspace, and appearances in the anthologies Making, Out!, Outspoken, and Canadian Brash. His reviews, essays, interviews, and columns have appeared in such magazines as Toronto Life, Xtra, What! Magazine, and Prairie Fire, as well as the Toronto Star. Most recently, he has been a contributing writer for the digital magazine Torontoist. The Bone Mother is his first novel.